This issue, which is pretty great, has plenty of flashbacks. 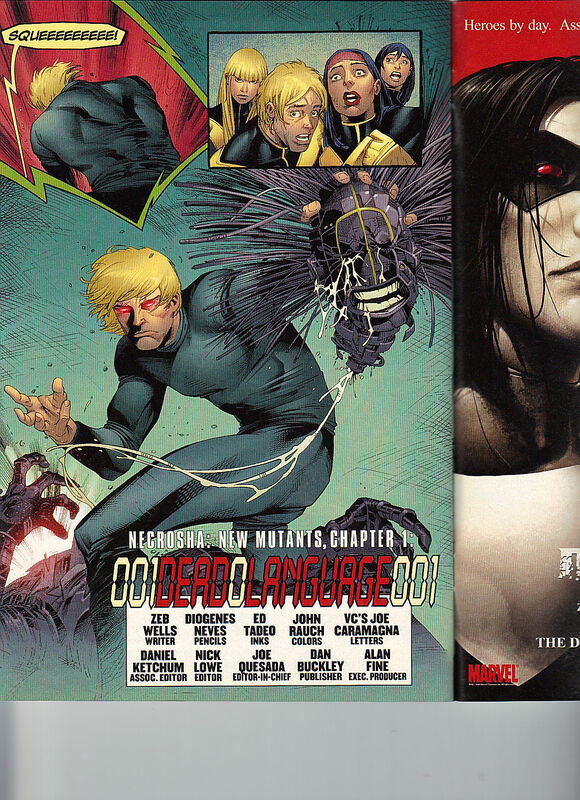 This great website has annotated issues, three of which I own and will be reviewing next. The buzz for this title has been outstanding, and I’m glad I finally had a reason to buy an issue. 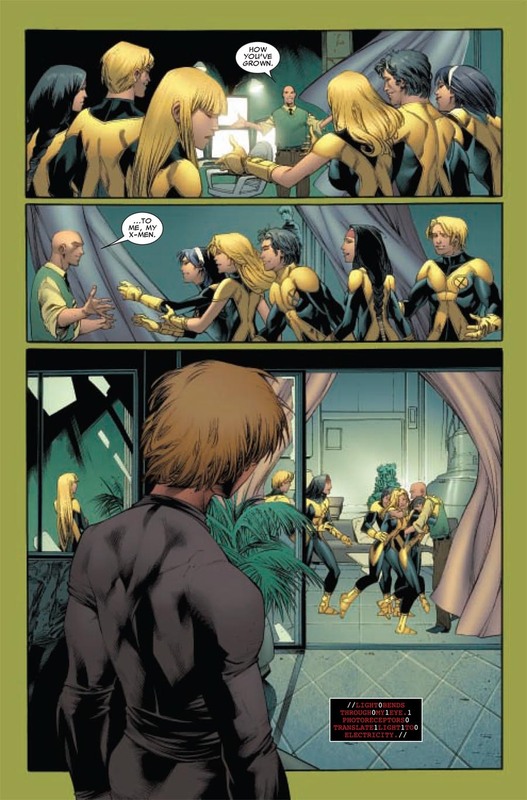 Bunn did such a great job with this series, that it got him the Uncanny X-Men Volume Four gig. I’ve been a fan of Walta’s work since the Dark Iceman Saga in Astonishing X-Men. Bellaire does such a good job, with giving the present day and the flashbacks, very distinctive looks. 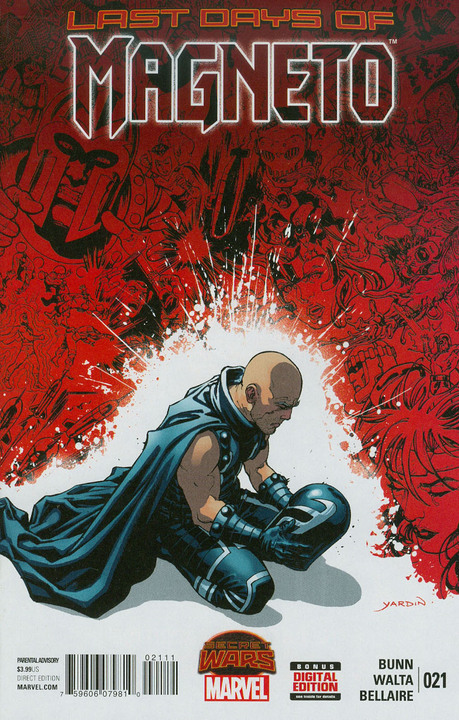 This is the final issue of the series, has – from the cover – these are Magneto’s Las Days, prior to the start of Secret Wars 2015. 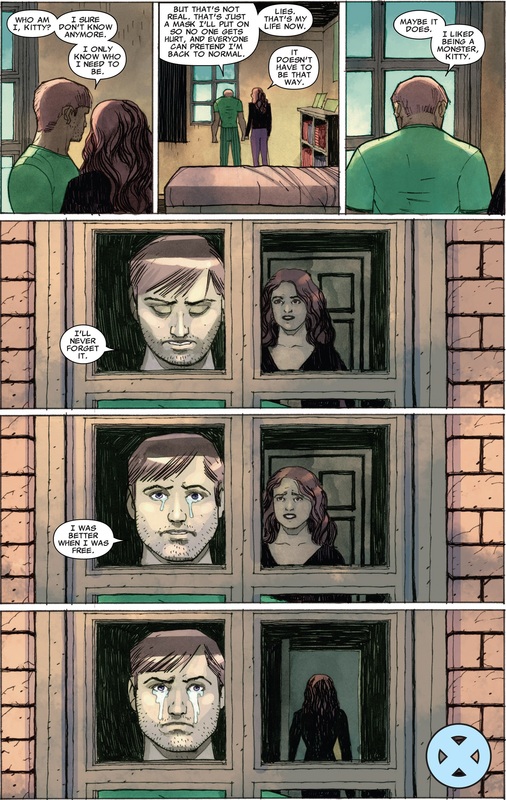 I guess, from the recap page, that Post-AXIS, when Magneto lost his parentage of Scarlet Witch and Quicksilver, so he has made attempts to get closer to his only child, Polaris. Unfortunately, he has absorbed her powers, so that he can attempt to fight off the Incursion, that ends the Marvel Universe. Spoilers, he doesn’t succeed, but I like the idea of him, admitting to fight the Incursion. Which does form a nice framework, that as he sacrifices his life, he also sees his life, flash before him. The reds of the flashbacks are so bold, as are the yellows of the present day. 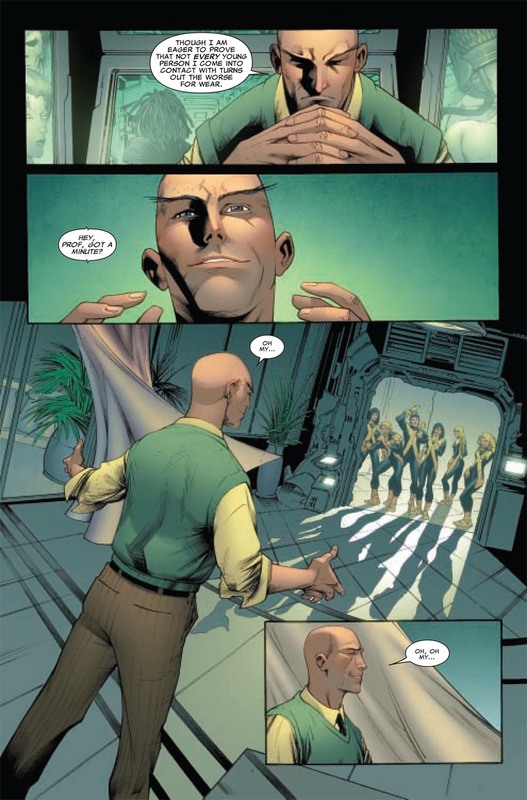 Issue opens with Magneto and a flashback to his, and the X-Men’s first appearance. He is fighting the troops at Cape Citadel, as the X-Men approach. In the present day, Magneto is absorbing all of the military planes – which, naturally, looks like him attacking them. Flashback # 2. This is from Uncanny X-Men 150, wherein Magneto sinks a Russian nuclear submarine. The submarine was filled with soldiers and Magneto (as a hologram) watched them die. I’m surprised the Marvel AR logo isn’t all over this issue. There is an ad for the Guardians of the Galaxy cartoon, coming to Disney XD, it already aired on September 26 (I’m typing this on, September 29th – which is forever ago, when you read this!) but I have to wait until it comes to Netflix. 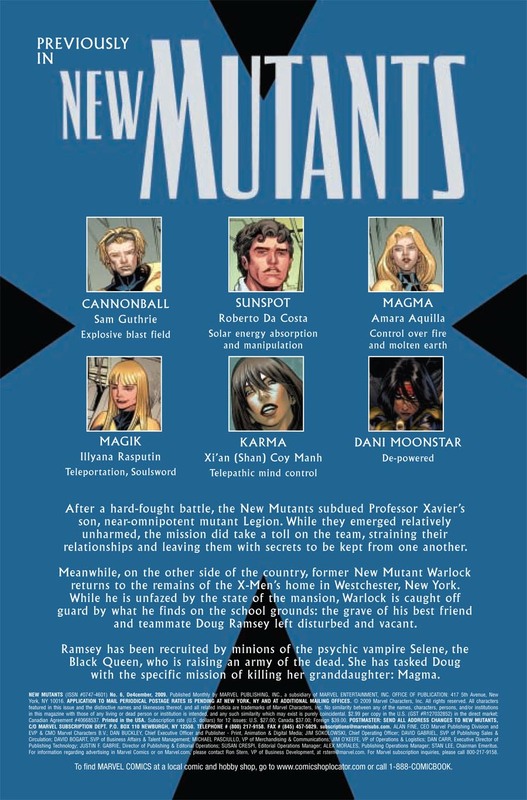 Too bad the cast is missing Kitty Pryde and Thing! In the present day. Magneto is thinking about how he will never shake the label of being, a monster. 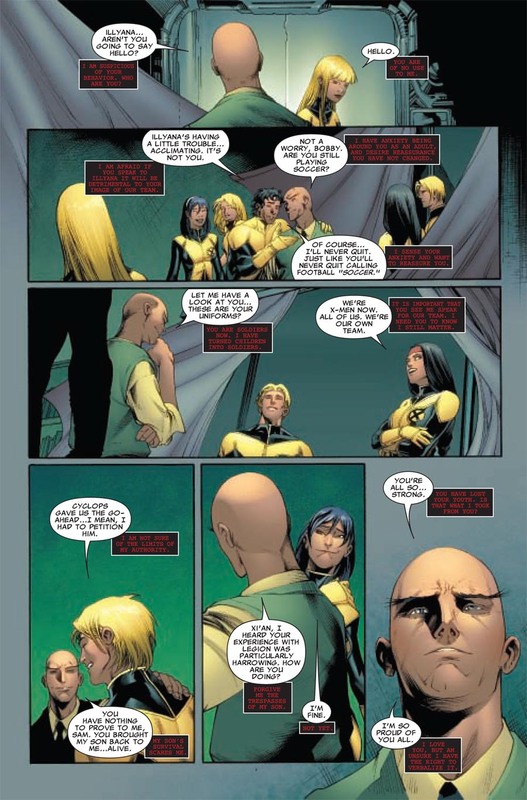 It is uncanny how much the X-Men have just shrugged their shoulders and accepted these deaths as something that happened but they don’t question it now. 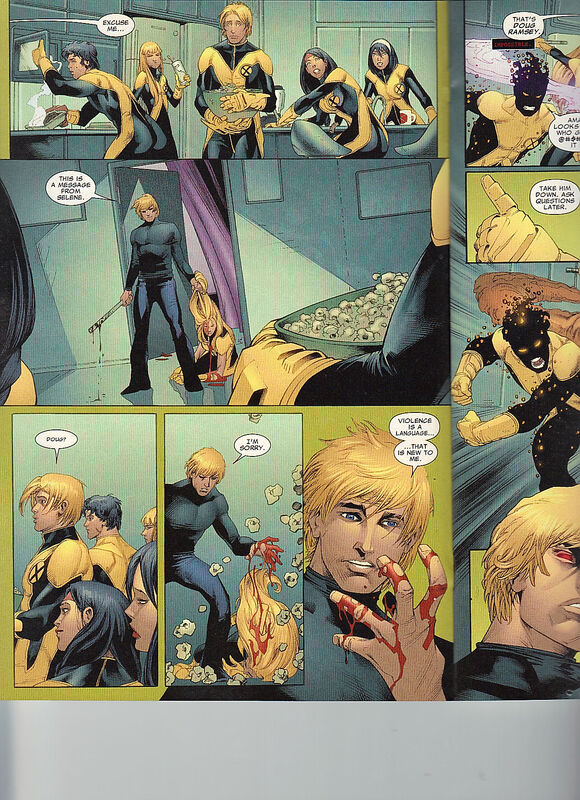 Raleigh, Magneto’s lady companion – I guess – tries to comfort Polaris. Polaris is having none of that nonsense, as Raleigh lured her there, just so Magneto can steal her powers. Raleigh has a leg brace, a metal one, that tears off of her leg, Polaris catches her, before she can fall to the ground. Magneto is absorbing all of the metal, that is around. 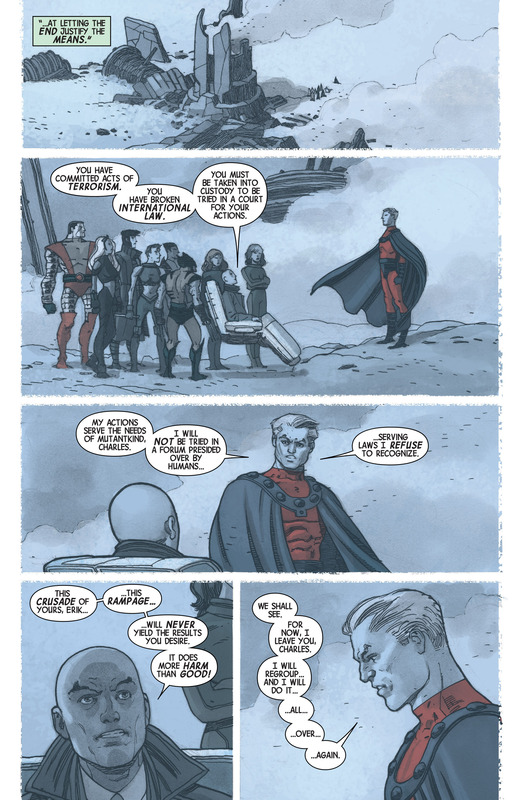 Polaris recognizes that Magneto, is always good at sacrficing himself. Especially as he doesn’t usually pay the price. Flashback 3. This one is from X-Men 87, the conclusion of the Magneto War. Xavier, in classic hoverchair, is confronting Magneto, about how he has gone too far. They couldn’t try Magneto back in Uncanny X-Men 200 (they tried) but flatscans won’t get a second chance. 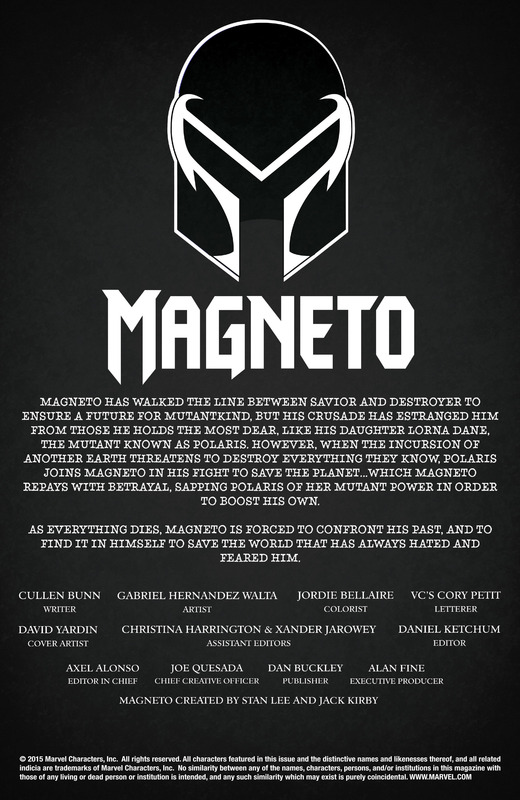 Magneto will not stop until mutant kind stands above the humans. Magneto, at this point, was trying to tilt the poles, which is what Ultimate Magneto did, at the beginning of Ultimatum. If humans could have given him a small country, they sure would have, if they known the utter destruction that that action will bring. 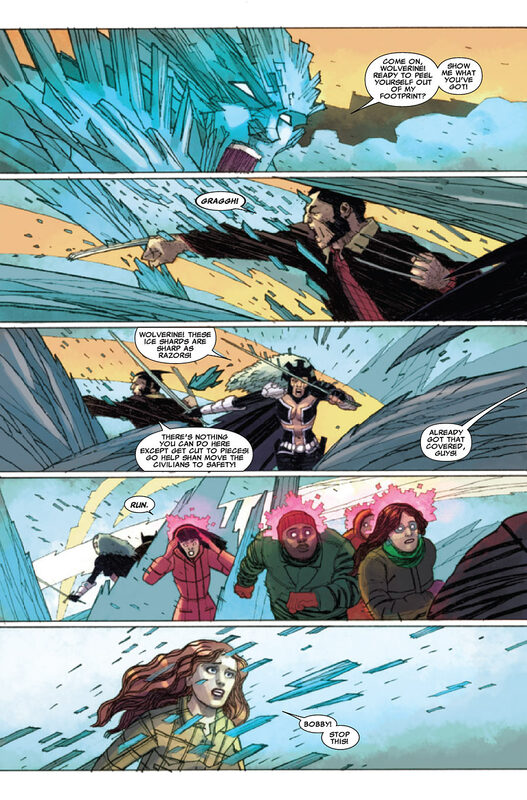 Wolverine tries to rush Magneto, Rogue and Storm holds him back – which is silly, as the worst Wolverine can do, is be thrown down into the snow. The United Nations Security Forces arrive, I can’t recall if this is the North or South Pole, I believe it is the South Pole, a it doesn’t look like a floating land mass. 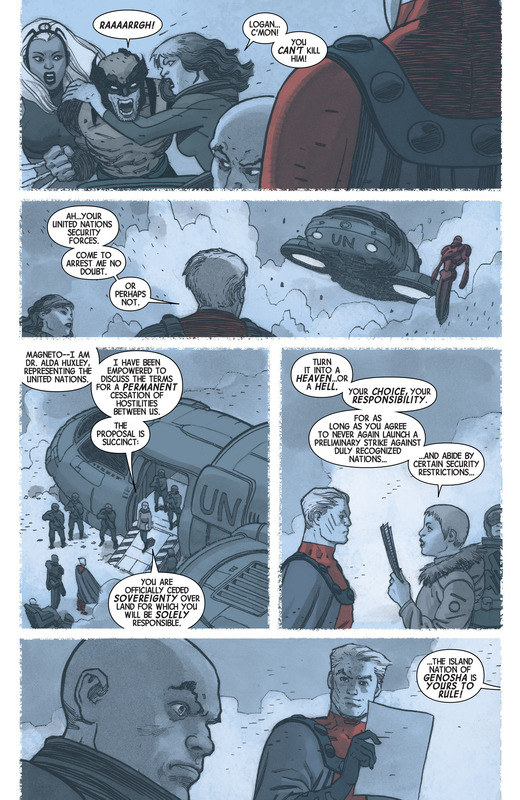 Dr. Alda Huxley, representing the United Nations, is here to cede Genosha to Magneto’s rule. That face of Xavier’s, is so fantastic! Made even better, by the smirk of Magneto! Present Day. Magneto is taking on all of the power of every device, that is around him. I’m not sure what the quick glimpses are for Flashbacks 4, 5 & 6. The sixth involves the Avengers but the other two look like generic Magneto v Wolverine & Cyclops and humans (for the fifth one). 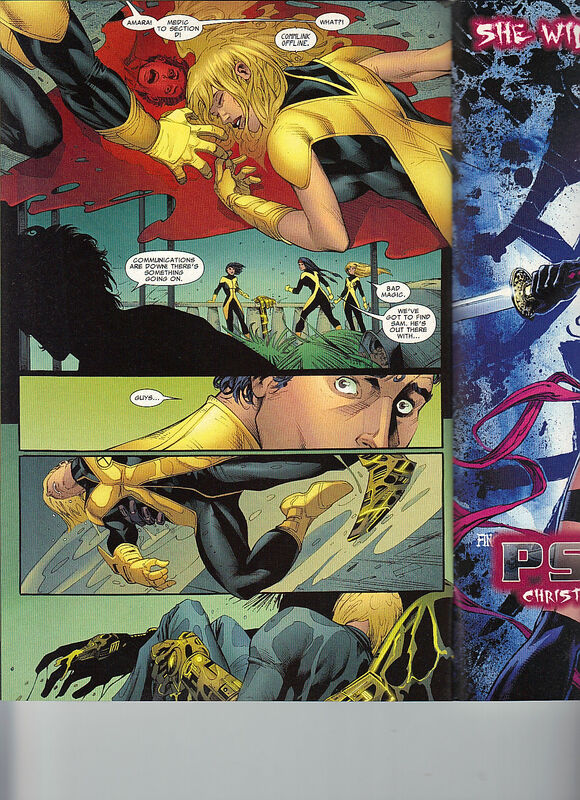 Flashback 7 is from X-Men 25, so the flashbacks are not in chronological order. I owned X-Men 25, until this post but Kitty Pryde isn’t involved in this issue. 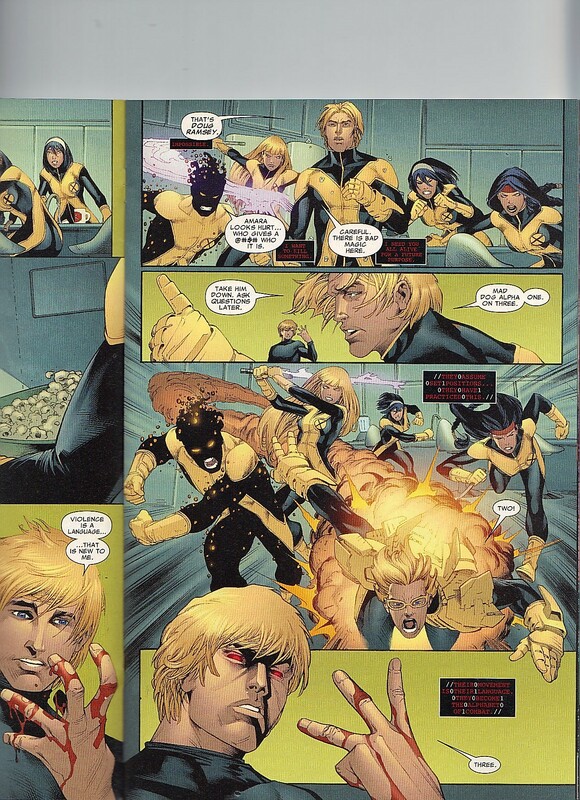 Nightcrawler and Captain Britain are, but not Shadowcat. She is in Wolverine 75, which takes place, after X-Men 25, but I added it to my For Sale pile, over at MyComicShop.com. Their website stated that they won’t be buying it for a few months, but still, another lost that this blog has caused. 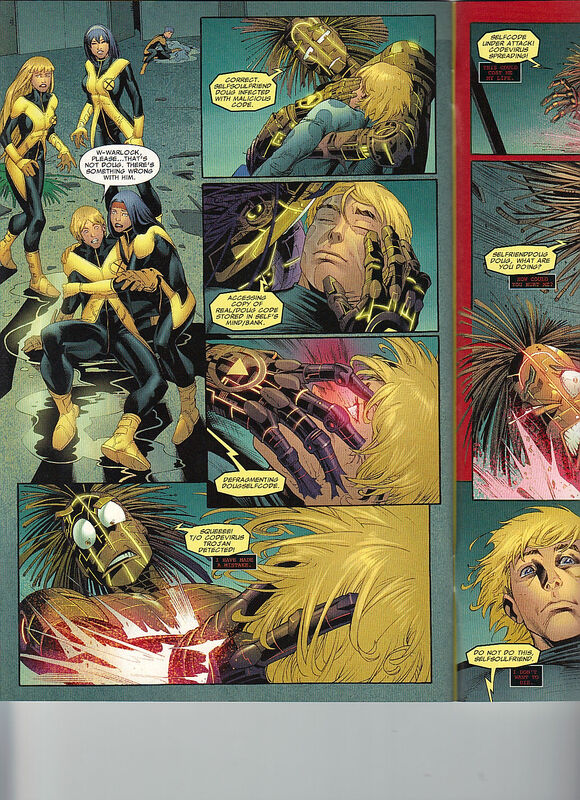 X-Men 25, of course, is the issue wherein Magneto ripped out the adamantium from Wolverine’s skeleton, which brought on the bone claws of Wolverine. Present Day. Magneto forces all of his absorbed energy into the Incursion but it fries him in the process. Then it engulfs the of the peeps in the crowd. At least Magneto tried. Such a great issue! I may have to try to read the trades of this series, or at the very least, follow along Bunn’s Uncanny X-Men run. Now that Astonishing X-Men Volume Three has come to an end. This conclusion wrapped up fast! Mystique doesn’t keep the Death Seed long at all. Awesome that it is Kitty who takes it out of her. I thought maybe Kitty was going to turn evil just by holding it as she disappears afterwards, but the story doesn’t go in that direction. She hides it somewhere, which who knows if that is ever going to get picked up ever again. Maybe during the next Apocalypse story, whenever that happens. Bobby’s father was not killed last issue. 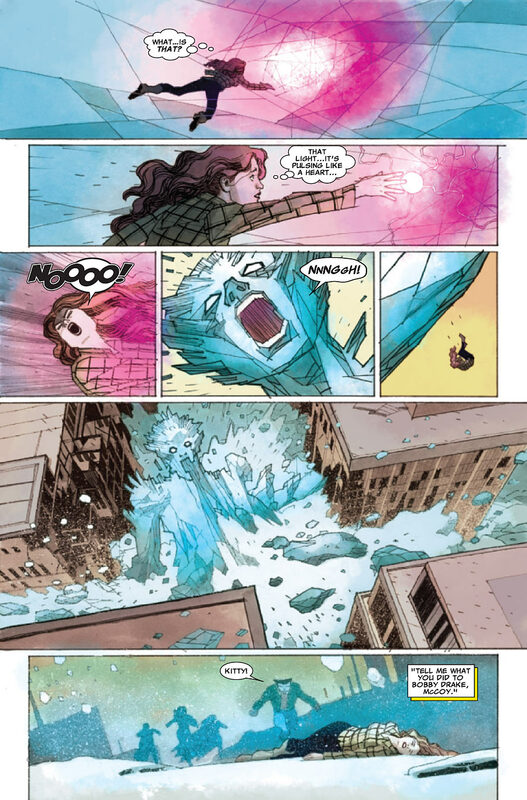 Apparently Iceman makes for a far better villain than a hero. Which I sort of like that he knows that, and doesn’t like that but has to be a hero as if he ever turn bad again, it would just be the same fight all over again. 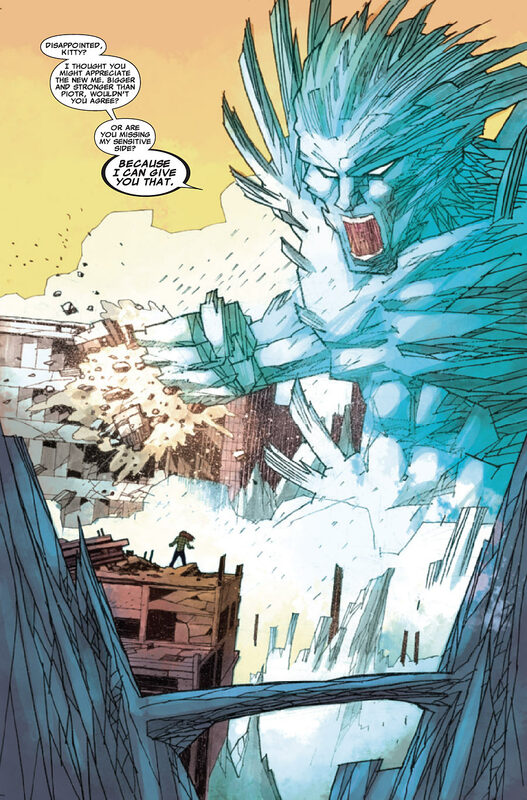 I really like that Liu made a reference to Uncanny X-Men 350, with how Gambit had to make his way home from Antarctica after being banished there. Which is still one of the oddest choices the X-Men have made as a team. Plus, that comic came out in 1997, 14 years ago. She really didn’t have to make the connection but it is totally cool that she did as that was a big moment in Gambit’s life as he was kicked off the team and pretty much left for dead. Odd that Karma knows that, but as she herself was left for dead once, maybe she’s keeping track of stuff like that. Really wish I knew the story with Opal, I wonder if it is even interesting to read for myself, or is it better to just have it be summarized like we get here and last issue. Does seem to be a messed up thing to do, tell a guy he is the father and then tell him he is not when he clearly can’t handle it. Of course, I imagine that, since this is a comic, that Bobby was meant to be the father, but a new editor came into the title and realized you can’t have one of the Original Five be a deadbeat father, as you already have that with Cyclops. Unless Bobby was first at it. Wonder which issues this whole thing takes place during. I bet it was during the Iceman mini. She only has 26 appearances, and I bet you could own them all under 50 dollars. She first showed up in X-Factor. I thought she was from the 60s, that must have been a different girlfriend. Liu does a great job writing Kitty, especially with the monologues. Kitty sure likes to speak at length. I also dig how no one is in a costume besides Warbird, Mystique and Thor. Which is odd, as their suits are temperature-controlled. I also like how Kitty can phase multiple people as long as she is holding one person, and that person is holding a different person. She can phase an entire human chain, which comes in handy. Not exactly sure why someone can’t place Bobby in jail, as people are dead, on such a huge scale. Maybe as he would get the chair, but hopefully it isn’t due to no cell can hold him. As he is a hero and should just stay in the cell under his own influence. Plus, it is the Marvel Universe, there is a cell to hold him or at least, that can attempt to. There should be a Hero Prison, like during Civil War, Prison 41 I want to say, that heroes voluntarily go to to serve a limited sentence for times like these. Kept off the books and can leave whenever. 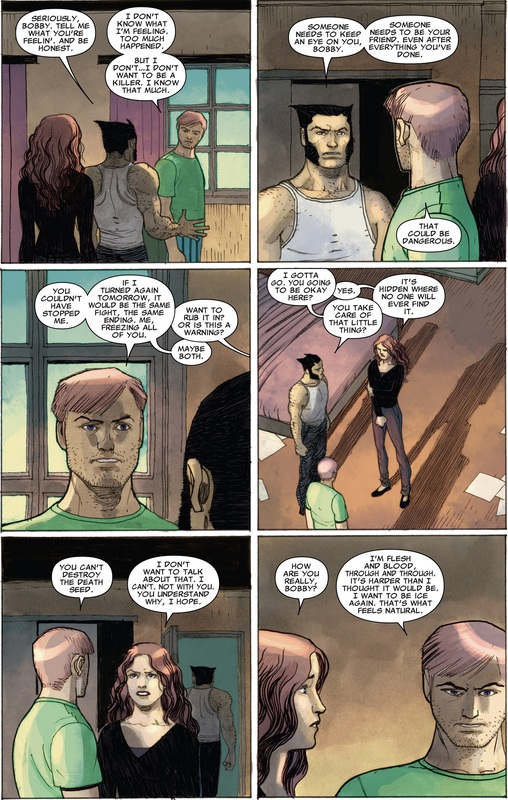 I could see Kitty and Bobby breaking up at the end, but he was under mind control, so she most likely gives him a pass, as she is friends with Wolverine and this type of thing happens to him all the time. I have no interest in the next issue, which is a shame as I really enjoyed this arc but I need more than Karma, Warbird, Cecilia Reyes and Vampire Jubilee to be interested in a comic. I wonder if we are going to get Crying Bobby as the legacy of this storyline. Just read the description of X-Factor 63, and it states Opal is adopted but only learned of it recently and now she wants to find her birth parents. What a messed up to thing to then do to a former boyfriend. Plus, she names her son, Robert, as well. 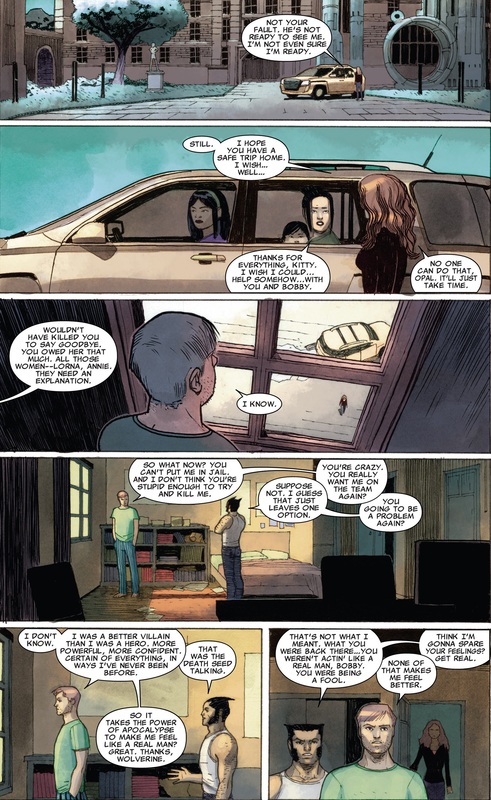 Hopefully her son has not been told about how Iceman could be the father or could not be the father, as he grew up, as that is a horrible thing to do to a child. 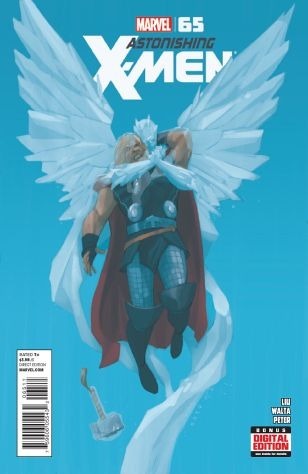 Okay, Robert first appears in that Iceman mini in 2001, that probably deals with all of this as Opal doesn’t appear again between that mini and this arc here. There probably is a website that has a review of it out there. Sounds like Opal was probably forced to lie to Bobby about being the father. He knows by the end that he isn’t so it wasn’t a long standing plot point until now. I just read the brief descriptions for each issue as it doesn’t sound very good. As serious as this comic is, there is a fun kinetic energy about it. I like the idea of Iceman going evil. He has one of those powers, where if he ever went bad, he would be unstoppable. 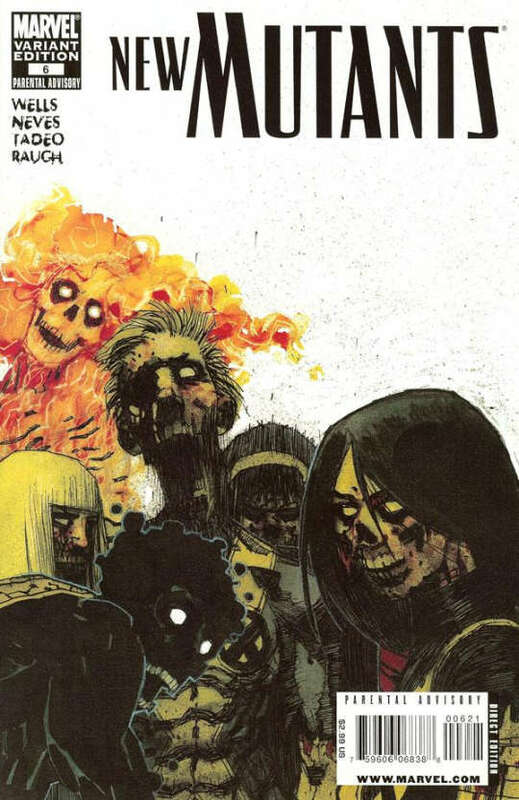 This creative team really brings it this issue. Walta’s facial expressions are spot on. 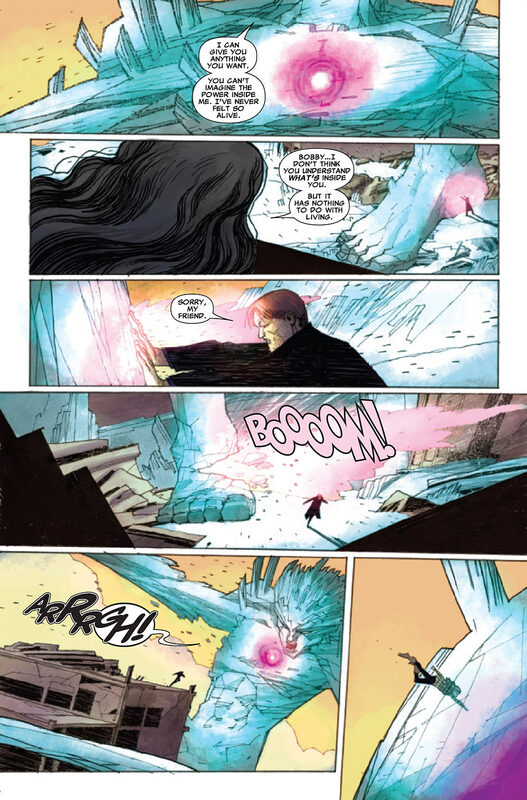 Peter’s colorings really give the book atmosphere, especially difficult when everything is covered in ice and snow. I love how Liu has Bobby shout Colossus’ name out to Kitty. He clearly doesn’t know her well enough to truly hurt her. Just going for the easy strikes. I like how Thor was taken down. I felt really bad about Bobby’s father, that is definitely going to be something he regrets once he’s normal again. Like when they don’t acknowledge that New York City was blanketed in snow, they will always still remember his father. 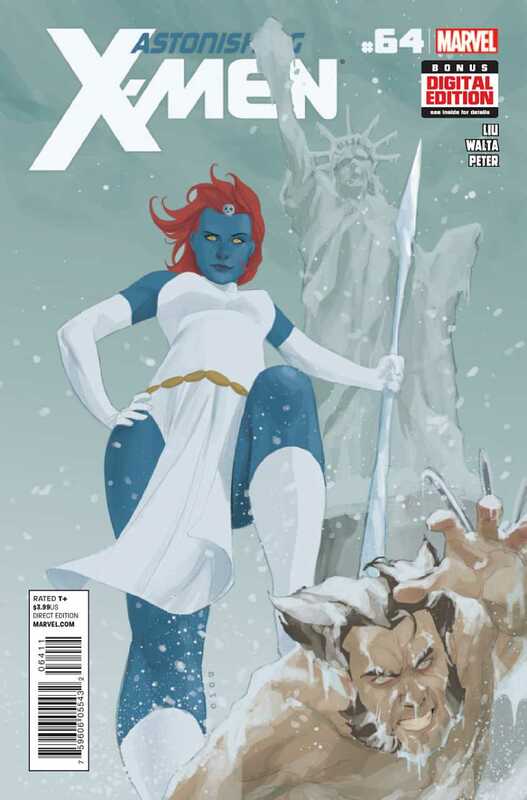 I am loving Mystique in this as well. She is one of those characters that can show up in three different title, be doing three different things, but still be the same character. Next issue holds a lot of promise.